NEWPORT BEACH — In a vote of 5-2, the Newport Beach City Council has voted to approve city sponsorship of the Newport Beach Christmas Boat parade and will pay $50,000 a year to help fund the event, for the next four years. While the parade has received anywhere from $30,000 to $50,000 from the city of Newport Beach in previous years, president of the Newport Beach Chamber of Commerce and former mayor Steve Rosansky believes that long-term funding will benefit both the event and the city. “I can tell you that we will use the funds to try to elevate the high-saturated parade that it is today to an even higher level,” Rosansky said at the Oct. 8 Newport Beach City Council meeting, where the sponsorship decision was made. “The parade generates an amazing amount of business in this town — not only for the restaurants which line the harbor, or for the catering companies that come out to people’s homes,” Rosansky said. “You can ask the visitor bureau yourself,” Rosansky responded. “People are coming and staying in hotel rooms here to watch the parade. “Although we are at a high level today, we’d still like to try and take that to the next level,” he added. “Visitors that come from outside of town to participate in watching the parade may spend money in Fashion Island or other places while they’re here.” Part of the reason for having the next four years’ funding locked in is so the chamber will have the financial stability to go out and seek and additional help with marketing, Rosansky said. He added that he hopes the Newport Christmas Boat Parade is one day elevated to the heights of the Rose Parade, in terms of visitor interest and popularity. In total, the parade has four sponsors: the city, Newport Beach and Co., Simple Green and Meguiar’s. Despite the parade’s popularity, some residents expressed doubts about the wisdom of granting the event more public funding during the public comment portion of the city council meeting. Mosher added that, according to the grant agreement, the approved funds can be used without restriction for anything related to the parade. And the grant agreement opens with a statement that 2013 is the Newport Beach Christmas Boat Parade’s 105th year, which Mosher said he believes is a myth. NEWPORT BEACH — The theme for this year’s five-night Newport Beach Christmas Boat Parade, hosted by the Newport Beach Chamber of Commerce, is “Rockin’ Around the Christmas Tree.” The 105th annual event is set for Dec. 18-22. “The parade is our community’s ‘Christmas card to the world,’ and sets the harbor ablaze with twinkling lights and holiday spirit like no other tradition in the country,” said Steve Rosansky, Newport Beach Chamber of Commerce president and CEO. Participating watercraft will range in size from 15 feet to more than 100 feet — and they will be adorned with lights, decorations, moving displays, music, dancers and more. More than 100 vessels are expected to light up Newport Harbor, which is also home to the Ring of Lights waterfront home decoration competition. Named the “Number 2 Destination for Holiday Lights” by Yahoo Travel in 2011 and one of the “Top 10 Christmas Happenings in the Nation” by the New York Times, the Newport Beach Christmas Boat Parade attracts about 1 million visitors each year, according to the Chamber of Commerce. Parade co-founders Joseph Beek and John Scarpa started the event back in 1908, and it was originally a summer parade of lighted gondolas. 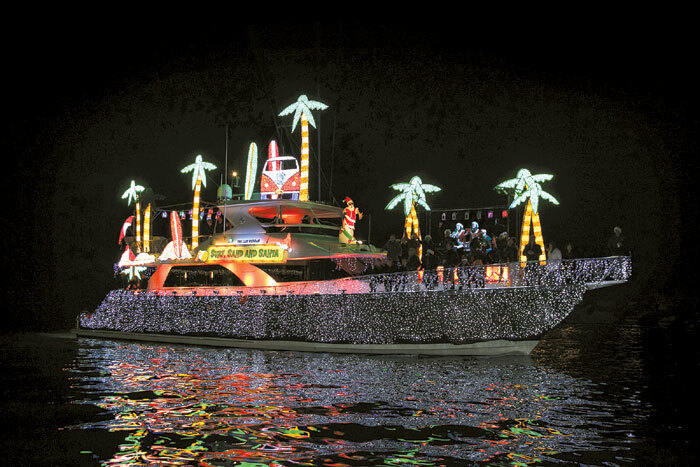 The annual event evolved to become a holiday parade of lighted and decorated boats in all shapes, sizes and configurations. And today, it is billed as the longest-running holiday lighted boat parade in the U.S. The parade is scheduled to begin at 6:30 p.m. in the Balboa Village area, and participating boats will navigate a 14.7-mile route ending off Bay Island at 9 p.m.
As is customary, the first and last night of the parade will features a fireworks show off the Balboa Pier. The parade is sponsored by the city of Newport Beach, Simple Green, Meguiar’s and Newport Beach & Co.
For more information, go to visitnewportbeach.com.